Go south from Coyhaique. After you pass Villa El Blanco, take a right to continue toward Cerro Castillo along the Carretera Austral. After a short while, you’ll enter Cerro Castillo National Park. Drive slowly; it’s common to see Huemules (South Andean Deer) along the side of the road. If you feel like stretching your legs, you can explore the Laguna Chiguay Trail in the park, which is accessible to all. The road ascends until it reaches the Ibáñez park entrance (3,937 feet above sea level). This marks the route’s highest altitude. After that, descend along the Diablo slope until you reach Villa Cerro Castillo, which is a good place to take a break, eat something, and appreciate the beauty of the massif that shares the town’s name. Continue south and prepare to begin your next adventure: driving on a gravel road. You’ll see Laguna Verde and, later, the Bosque Muerto (Dead Forest), caused by the 1991 eruption of the Hudson volcano. The road ascends to the Cofré park entrance and into the Murta Valley, where you’ll find the roads that lead to Puerto Murta and Sánchez. Keep right and 15 miles later, you’ll arrive at Puerto Tranquilo, which has beautiful views of Lake General Carrera, the second-largest lake in South America. You’ll find various options for lodging, food, and excursions in town. Today, we invite you to explore Laguna San Rafael National Park, taking Route X-78 48 miles west from Puerto Tranquilo, where it winds through the Exploradores Valley. The road is surrounded by forests, rivers, dozens of waterfalls, hanging glaciers, and snowy peaks. There is also the option––for more adventurous travelers––of hiking on the Exploradores Glacier, which can be found on Mount San Valentín (12,828 feet above sea level), the highest peak in Patagonia. If you’re interested in completing this hike, you’ll need to hire a certified guide in Puerto Tranquilo. Around 31 miles south of Puerto Tranquilo, you’ll find the intersection that leads to Route CH-265, the road to Puerto Guadal and Chile Chico. Keep right, toward Cochrane, and after a little while you’ll reach Puerto Bertrand, located on shores of Lake Bertrand, where the Baker River begins. Various excursions are available in Puerto Bertrand, including rafting and kayaking on the river, as well as fishing. We suggest stopping here to take advantage of the opportunity to explore the wonders of this river, which has the highest volume of water of all Chile’s rivers. Further south, you can also take in the beauty of the confluence of the Baker and Nef rivers. Roughly 11 miles before arriving at Cochrane, you’ll come across the intersection that leads to the Baker park entrance or Roballos Pass, via Route X-83. Take Route X-83 left and, after 7 miles, you’ll arrive at the Patagonia National Park administration center, where you can find campsites, a restaurant, and two lodges. We suggest spending one full day exploring Patagonia Park’s various trails, though ideally, you’ll set aside at least two days to take advantage of all the park has to offer. Whether you stay in the park or in a nearby town such as Cochrane, you’ll have access to a network of hiking trails, which you can choose from based on weather, your physical condition, and your itinerary. For more seasoned hikers, one excellent option is Lagunas Altas, a 14-mile trail that leads you past 7 different high-altitude lagoons and offers spectacular views of the Chacabuco Valley, where you can see the Patagonian steppe in all its splendor. There’s also the option of doing the Roballos Pass scenic drive, which takes you 46 miles along Route X-83 toward the Argentinian border and is great for spotting wildlife. Finally, you can also use this route to head to other camping areas in the park, including Casa de Piedra (located 15.5 miles from the park administration center) and Alto Valle (located 28 miles from the park administration center). During your stay here, you can sleep in one of the park’s various campsites, in a lodge, or in a nearby town such as Cochrane. If you’re out of time to spend in this area of the park, head back to the Carretera Austral, which will take you to Cochrane, where you can tank gas and visit the Tamango sector of Patagonia National Park. The Tamango sector offers a large variety of trails and campsites, from which you can appreciate the river and Lake Cochrane’s beauty. Continue south toward Tortel and take in the incredible landscape this section of the road has to offer. If you have time, we recommend making a detour on Route X-901 to get a view of the gorgeous Calluqueo Glacier on Mount San Lorenzo. You can also visit the Los Ñadis sector, located 28 miles south of Cochrane, where you’ll find the “Corte San Carlos,” declared a National Historic Monument. Around 62 miles from Cochrane, you’ll come across the intersection with Route X-904, which you can take to reach Tortel, a town at the mouth of the Baker River that sits over gorgeous boardwalks made from Ciprés de las Guaitecas (Pilgerodendron). You can find various lodging, food, and tourist offerings in Tortel. On this day of your trip, we suggest setting out on one of the boat tours available in Tortel to visit the spectacular Jorge Montt glacier, which is located in Bernardo O’Higgins National Park. You’ll sail through channels and, as you begin to get closer to the Southern Icefields, you’ll be able to see the chunks of ice that dislodge themselves and fall from the glaciers. This is a great excursion that offers an opportunity to see a pristine landscape explored by few. Back in town, explore Tortel’s various lookout points and enjoy your last night in this beautiful place. Get back on the Carretera Austral and continue south to Puerto Yungay. Take the ferry across the Mitchell Fjord, a trip of approximately 45 minutes. From Río Bravo, drive 62 miles until you reach Villa O’Higgins, one of the main ports of entry to the Southern Icefields. You can find lodging, food, and tourist excursions in Villa O’Higgins. You’ve arrived at the end of the Carretera Austral! Take this day to sail the imposing Lake O’Higgins until you arrive at the Southern Icefields, where you’ll first come face-to-face with a glacial wall nearly 2 miles wide and 230 feet high, from which icefalls frequently plummet and splash into the water––hundreds of which you’ll see floating in the lake below. The boats that make this trip set out from Bahamondes Bay, 4.5 miles south of Villa O’Higgins, and run from September to April. Prior reservations are required, and the boats have a capacity of 56 passengers. The trip is only available on certain days, so be sure to check schedules and prices and make your reservations at: http://www.villaohiggins.com/hielosur/index.htm. If you’re not able to make the trip to the glacier, we suggest exploring the various trails in Villa O’Higgins, an activity you can also coordinate with local tour guides. Stay the night in this beautiful town. It’s time to begin your return trip. Head north on the Carretera Austral. Tonight, you can stay in Cochrane or Puerto Bertrand. Enjoy the intense turquoise color of the river and Lake Cochrane and the imposing waters of the Baker River. Continue north, and 40 miles from Cochrane, you’ll come across the detour that will take you to Chile Chico via Route CH-265. The road winds along the shores of Lake General Carrera and has been called one of the most beautiful routes in Chile. The lake changes its colors with the changing lights and tones of the days and is surrounded by impressive mountain ranges. Next, you’ll reach Puerto Guadal, where you can tank gas, stock up on provisions, and visit the Los Maquis waterfall. After Mallín Grande, you’ll reach the Las Llaves pass. Drive carefully––you have 18 miles of sharp curves ahead, with steep cliffs that plunge down to Lake General Carrera below. Next, you’ll pass Fachinal, then Bahía Jara, which has beautiful white-sand beaches. Once you’ve driven nearly 111 miles since leaving Cochrane, you’ll arrive at Chile Chico, a border down that has lodging, restaurants, and services, and is very close to the Jeinimeni sector of Patagonia Park. Today, you’ll board the ferry from Chile Chico to Puerto Ibáñez. Depending on the day of the week, the ferry leaves either at 8 a.m. or in the afternoon. Remember to make your reservations in advance. Check schedules and prices at: http://www.barcazas.cl/barcazas/wp/region-de-aysen/lago-general-carrera/horarios-y-tarifas/. If the ferry leaves in the afternoon, we suggest using the morning to visit the Jeinimeni Sector of Patagonia National Park, either driving to the lake (mile 40/kilometer 65, Route X-753) or exploring the Piedra Enclavada Sector (mile 15.5/kilometer 25, Route X-753). Once you’ve boarded the ferry to cross Lake General Carrera, you’ll have a couple hours aboard before reaching Puerto Ibáñez. From Puerto Ibáñez, drive 72 miles until you reach Coyhaique. You can also visit Laguna San Rafael with one of the boats setting out from Puerto Chacabuco. Bahía Murta and Puerto Sánchez are other good alternatives for finding lodging if you decide not to stay in Puerto Tranquilo. At Puerto Sánchez, you can find excursions on Lake General Carrera that offer trips to other marble formations, which are lesser-known and more off the beaten path. 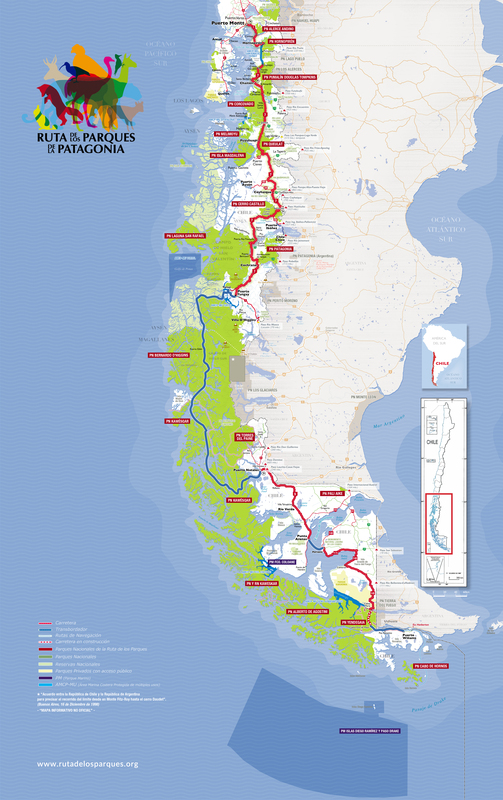 You can do this same route in the opposite direction, that is, leaving from Puerto Ibáñez and traveling to Chile Chico. You can also visit the Los Leones Valley sector, located south of Puerto Tranquilo, where you can organize hiking trips and horseback rides to the lagoon and glacier that share its name. From Chile Chico, you can cross to Los Antiguos via the Río Jeinimeni Pass, then drive south along Route 40 and cross back into Chile at the Roballos Pass, to reach Patagonia Park. From Puerto Ibáñez and Balmaceda, you can cross into Argentina via the Ibáñez-Pallavicini and Huemules Passes. Sky and LATAM Airlines offer daily flights to Balmaceda Airport, located 34 miles southeast of Coyhaique. From Coyhaique, head south on the Carretera Austral for 139 miles. From Coyhaique, head south on the Carretera Austral 205 miles. There are no gas stations in Cerro Castillo or Tortel. There are gas stations in Puerto Tranquilo, Cochrane, Puerto Guadal, Chile Chico, and Villa O’Higgins. To reach Villa O’Higgins, you’ll need to cross the Mitchell Fjord. The ferries do not require prior reservations, but we do suggest checking schedules in advance at: http://www.barcazafiordomitchell.cl/. For more information about the Río Jeinimeni Pass, visit: http://www.pasosfronterizos.gov.cl/complejos-fronterizos/aysen/paso-rio-jeinemeni/. For more information about the Ingeniero Ibáñez Pass, visit: http://www.pasosfronterizos.gov.cl/complejos-fronterizos/aysen/paso-ingeniero-ibanez-pallavicini/. For more information about the Huemules Pass, visit: http://www.pasosfronterizos.gov.cl/complejos-fronterizos/aysen/paso-huemules/. The largest national park in Chile and one of the largest in the world, with 26% of the park in the Aysén region and the remaining 74% in the region of Magallanes.